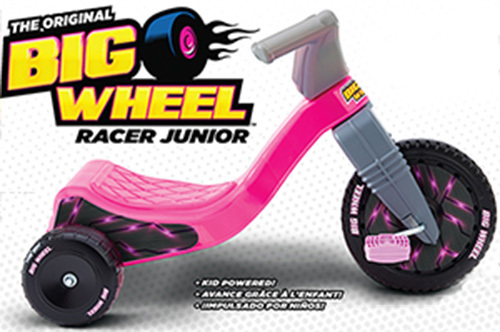 The Original Big Wheel Pink Jr. Racer 9" Trike. 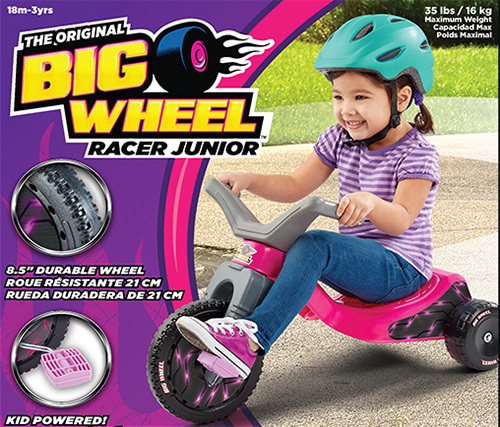 The Original Big Wheel Pink Racer Jr. 9" Trike. Please allow 2 to 8 weeks for delivery. Expedited shipping is available. (See Shipping Table). Assembled trikes are shipped in a plain brown box. The Un Assembled one is shipped in the original box above. Weight limit is 35 lbs. High-visibility colors for riding safety. Does not have a hand brake. For ages 1 to 3 yrs. Assembled: 24 x13 x 16"